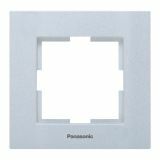 PANASONIC, know also with its previous name Matsushita Electric Industrial Co., Ltd is one of the biggest electronic production companies in the world. Founded in 1918 by Konosuke Matsushita, the company today is one of the huges electronics manufacturers on the planet. Their products are famous with quality, durability and long life. 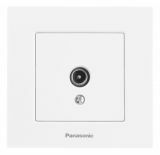 Single frame, Karre Plus, Panasonic, 81x83mm, silver, WKTF0801-2SL Single frame for sockets and switches from Karre Plus series of Panasonic. Model WKTF0801-2SL. Silver color. 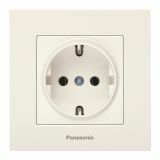 Single power socket (EU schuko), complete set, 16A, 250VAC, beige, Karre Plus, Panasonic, WKTC0202-2BG Single wall power socket EU type (2P+E, schuko) in natural beige color from Karre Plus by Panasonic designed for flush mounting. Panel size: 81x83mm. Complete set incl. frame. Clean and modern design suitable for residentital, office and commercial areas. For indoor use only IP20. 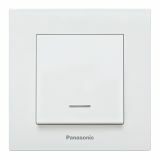 One-way light switch (single), complete set, white, 10A, 250VAC, Karre Plus, Panasonic, WKTC0001-2WH Single pole, one-way light electrical switch Karre Plus from Panasonic Eco Solutions suitable for wall mounting. Modern, minimal design in pure white color suitable for residential, office and commercial buildings. Complete set incl. frame. Size 82x82mm. Easy to install. Single frame, Karre Plus. 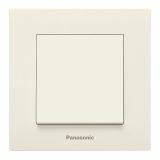 Panasonic, 81x83mm, bronze, WKTF0801-2BR Single frame for sockets and switches from Karre Plus series of Panasonic. Model WKTF0801-2BR. Bronze color. One-way light switch (single), complete set, beige, 10A, 250VAC, Karre Plus, Panasonic, WKTC0001-2BG Single pole, one-way light electrical switch Karre Plus from Panasonic Eco Solutions suitable for wall mounting. Minimal and clean design in natural cream color suitable for residential, office and commercial buildings. Complete set incl. frame. Size 82x82mm. For indoor use only IP20. 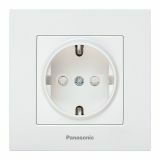 Single power socket (EU schuko), complete set, 16A, 250VAC, white, Karre Plus, Panasonic, WKTC0202-2WH White, single wall power socket EU type (2P+E, schuko) Karre Plus by Panasonic designed for flush mounting. Panel size 81x83mm. Complete set incl. frame. Clean and modern design suitable for residentital, office and commercial areas. For indoor use only IP20. Remote control for PANASONIC Remote control for PANASONIC N2QAYB000490. 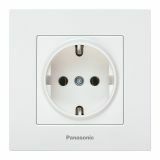 Single power socket (EU schuko), child protection, complete, 16A, 250VAC, white, Karre Plus, Panasonic, WKTC0212-2WH White, single wall power socket EU type with baby security protection (2P+E, schuko) Karre Plus by Panasonic designed for flush mounting. Panel size 81x83mm. Complete set incl. frame. Clean and modern design suitable for residentital, office and commercial areas. For indoor use only IP20. 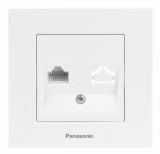 Single frame, Karre Plus, Panasonic, 81x83mm, dark gray, WKTF0801-2DG Single frame for sockets and switches from Karre Plus series of Panasonic. Model WKTF0801-2DG-EU2. Bronze color. One-way light switch (single + LED illuminated), complete set, white, 10A, 250VAC, Karre Plus, Panasonic, WKTC0002-2WH Single, one-way light electrical switch for wall mounting with LED indication from Karre Plus by Panasonic Eco Solutions (WKTC00022WH). White color and minimal design suitable residential, hotel and commerical buildings. Complete set incl. frame. Size 82x82mm. For indoor use only IP20. 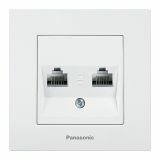 2-gang socket frame, Panasonic, silver, WKTF0809-2SL 2-gang frame for sockets and switches from Karre Plus series of Panasonic. Model WKTF0809-2SL. Silver color. 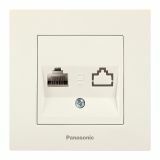 One-way light switch (LED illuminated), complete set, beige, 10A, 250VAC, Karre Plus, Panasonic, WKTC0002-2BG Single, one-way wall light electrical switch with LED lamp from Karre Plus by Panasonic (WKTC00022BG). Practical solution to keep you orientated at night time or in dark areas. Natural cream color and minimal design suitable residential, hotel and commerical buildings. Complete set incl. frame. Size 82x82mm.